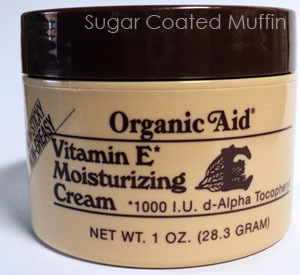 After trying out the facial foam, the Organic Aid vitamin E moisturizer caught my interest. A moisturizing cream that's not sticky nor greasy? Yes please.. I think Organic Aid seriously needs to put more time towards developing their packaging (remember the screw cap on the facial foam?). 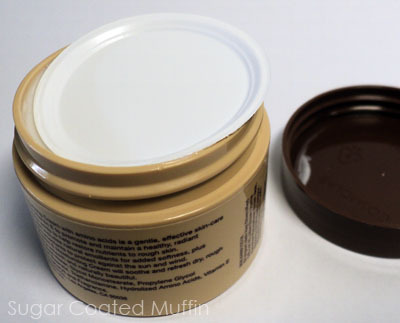 The inner cover is so soft and flimsy, it's hard to remove (it's stuck on the cream). I also spot some leakage on the external cover. Then when I replaced the inner cover, the cream was oozing out from the sides. Perhaps not so travel safe... But I do like the light plastic jar. The cream itself is thicker than my usual gel cream moisturizers and is harder to spread. 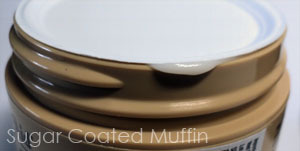 After massaging it in, it dries quickly to a powdery finish that's matte, not sticky and non greasy, just as claimed! D-alpha-Tocopherol is a natural Vitamin E that is extracted from wheat germ. It's a powerful antioxidant that reduces the effects of wrinkles, blemishes and pigmentation while replenishing the upper skin barriers with an ideal moisture level, heals & soothes skin. Glycerine is an effective moisturizer that further improves softness by maximizing hydration, for that silky smooth touch. It contains natural Vitamin E. Non-comedogenic and hypo-allergenic. •Enhances the skin elasticity which tones and smoothes out fine wrinkle. •Soothes and refreshes dry, irritated skin. •Protects skin against sun and wind. •Moisturizes and nourishes dry skin. •Helps retain and enhance skin moisture balance. Since my face naturally produces a lot of oil, it does turn quite oily after a while but other areas like my hands and elbows remained non-greasy. Ingredients : Deionized Water, Glycol Monostearate, Propylene Glycol Monostearate, Diglycol Stearate, Triethanolamine, Hydrolyzed Amino Acids, Vitamin E (1000 I.U. d-Alpha Tocopheryl) and Fragrance. 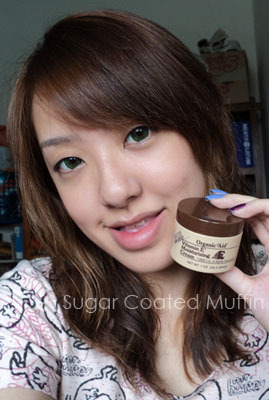 My conclusion : Maybe I'll repurchase this. Not sure. Since I have dehydrated skin, I may need more moisture but I'm trying to layer it over my usual moisturizer.